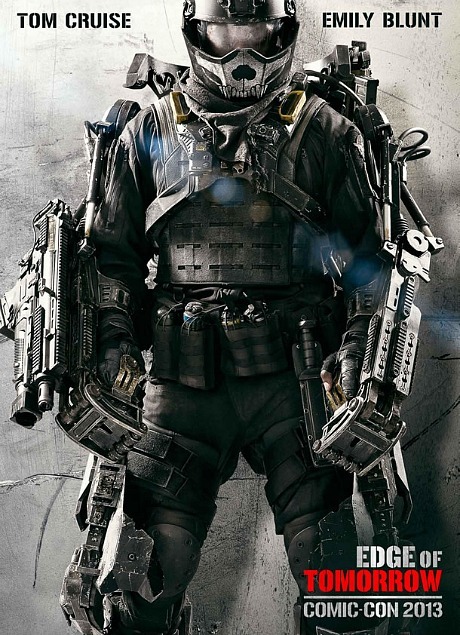 In reality, of course, that’s the first new poster for “Edge of Tomorrow,” which is the crushingly-generic title that replaces the infinitely catchier “All You Need Is Kill” on the eve of it’s big SDCC rollout. Based on a Japanese YA novel, the basic premise is either “Groundhog Day” in “Starship Troopers” or “What if you got infinite continues in real life? ?” Cruise is a future-war soldier (that’s presumably him in the suit) who dies in combat but finds himself stuck in a temporal loop – he keeps starting over from the beginning of the fight every time he dies, getting a little more skilled and making a little more progress each time. Interestingly, Emily Blunt is playing Earth’s most-decorated super-soldier; a living-legend that Cruise’s character keeps meeting up with and (presumably) trying to measure up to. That’s a fun inversion, given Cruise’s propensity for playing omnicompetent supermen. We’ll presumably find out whether this looks any good when it breaks at Comic-Con. Big Picture: "The Lone Ranger – What Happened?"